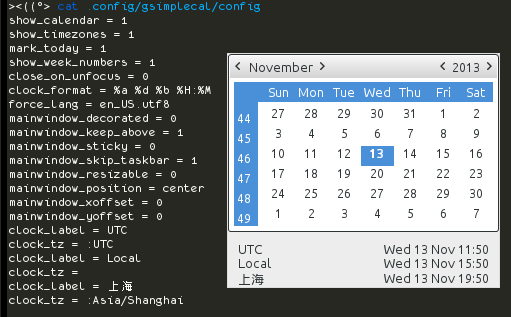 gsimplecal is a lightweight calendar application written in C++ using GTK. It was intentionally made for use with tint2 panel in the openbox environment to be launched upon clock click, but of course it will work without it. In fact, binding the gsimplecal to some hotkey in you window manager will probably make you happy. The thing is that when it is started it first shows up, when you run it again it closes the running instance. In that way it is very easy to integrate anywhere. No need to write some wrapper scripts or whatever. 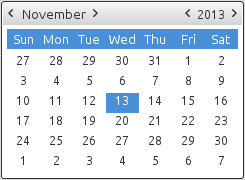 Also, you can configure it to not only show the calendar, but also display multiple clocks for different world time zones.